The History of Superman on Film – Part I: The Early Years | hesaidwhatnow? This month, the latest cinematic reincarnation of Superman hits our screens with the release of Man of Steel. With an estimated budget of $225 million, some of the biggest names in Hollywood behind it, and a current climate of staggering success for superhero movies, all involved in this latest adaptation are hoping for big things. What many people don’t realise, however, is that the world’s most famous superhero has had a tumultuous history on film, with far more failures than successes. Firings, feuds, projects that failed to launch – to date most plans for Superman on screen have been as successful as a Lex Luthor heist. Can Man of Steel buck the trend? Hesaidwhatnow? presents an examination of Superman on film that is as epic as it’s subject matter. So epic in fact that this is just Part I – a look at the early years. Log back in for further instalments that look at the flops, the lost years, Superman Returns, and of course, Man of Steel. 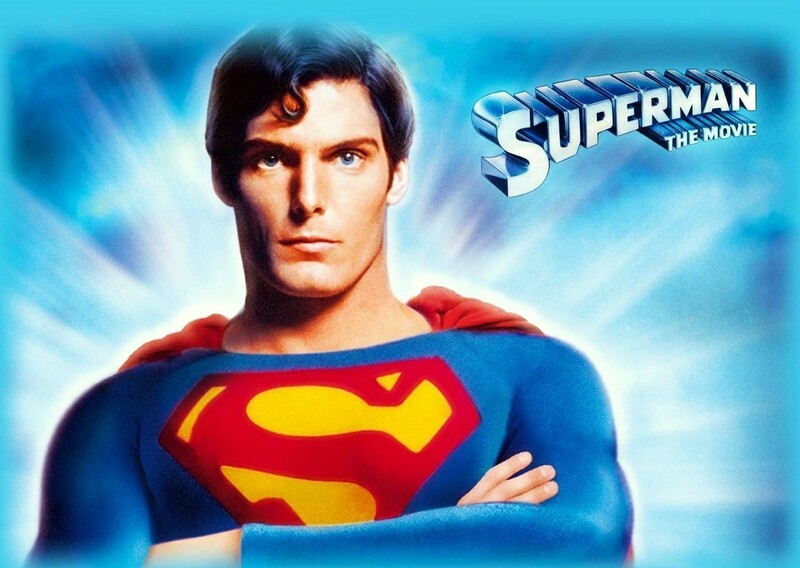 Despite being a wildly successful comic, a popular TV series, and a household name in many parts of the world, a movie adaptation of Superman didn’t hit the big screen until 1978. The film was immensely successful, earning over $134 million domestically at the box office – the second highest grossing film of the year behind Grease – as well as almost universal critical acclaim, but it wasn’t without a host of difficulties leading up to its release, and certainly not afterwards. The film had its origins in 1973, when producer Ilya Salkind first developed the idea of bringing the superhero to life on the silver screen. It was a difficult process. DC Comics, who owned Superman, wanted input on the casting of their star character before allowing him to be sold. When Salkind produced a list of Al Pacino, James Caan, Steve McQueen, Clint Eastwood, Dustin Hoffman and Mohammed Ali (seriously), DC was satisfied and sold the film rights to the franchise to him, his father Alexander, and their partner Pierre Spangler. 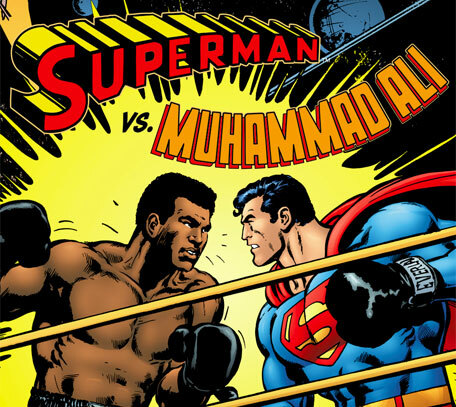 Float like a butterfly vs faster than a speeding bullet: Ali was actually on the first list of names to play Superman, which is almost as crazy as this comic cover. Before any casting was finalised, however, Salkind and his partners set about signing a director and a screenwriter, with a view to having two movies filmed at the same time so as to keep production costs down. Indicative of what was to come, this wasn’t easy. Ilya Salkind hired Alfred Bester to write a treatment, but Alexander didn’t think he was famous enough, and so brought in Mario Puzo of The Godfather fame to write the screenplay on a Superman sized $600,000 salary. The search for a director bordered on disaster, with negotiations breaking down with seemingly everyone in Hollywood. Francis Ford Coppola turned down the opportunity, as did George Lucas who was committed to Star Wars, and most famously Sam Peckinpah was removed from consideration when he produced a gun at a meeting. He was politely rejected faster than a speeding bullet. Ilya was keen to hire a young director by the name of Steven Spielberg, but Alexander first wanted to see how his “big fish” movie panned out. Of course Jaws panned out very well indeed, but by the time Alexander was convinced, Spielberg was unavailable, as he had Close Encounters of the Third Kind to work on. By this point, it looked as though the project had died before it had begun. In 1975 things began to pick up – or so it seemed. Salkind had hired Guy Hamilton to direct, Puzo had finalised the screenplay for both films, and in a big coup, Marlon Brando had signed on to play Superman’s father, Jor-El. Brando’s engagement, however, was a mixed blessing. Brando’s salary paid him $3.7 million plus 11.75% of box office receipts, a hefty chunk of money for what amounted to essentially an extended cameo. It didn’t end there. Brando’s contract stipulated that all his scenes had to be shot within twelve days, and he refused to learn any of his lines. (Cue cards had to be made on set for each of Brando’s scenes, and in one instance, his dialogue was written on baby Superman’s nappy!) 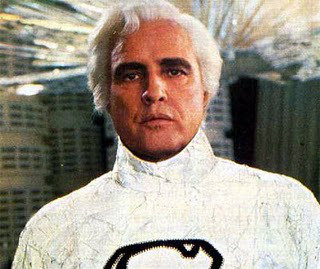 Most bizarrely of all, Salkind once revealed that during an early meeting on the role, Brando suggested Jor-El could be a talking suitcase or a floating bagel. Even for a movie about a super-powered alien wearing underpants on the outside of his trousers, that suggestion raised a few eyebrows. “Kal-El, I am your father. There were also problems with Puzo’s screenplay. It came in at 500 pages for both films – far too long given that the average screenplay is around 100 to 120 pages. Subsequently the Salkinds hired Robert Benton and David Newman to rewrite the screenplay, however Benton became too busy to afford any time to the project, and had his wife, Leslie, do the rewrites instead. Just in case five writers weren’t enough, George MacDonald Fraser was also hired to work on the project. The end result was unsurprisingly a mess. The screenplay had been trimmed by 100 pages, but was still far too long. Not only that, it had now taken on a decidedly camp tone, and was a jumble of confused ideas. Nonetheless pre-production began. Reflective of the project to date, even this was a disaster. Set construction started in Italy, but Brando couldn’t film there as a warrant for his arrest on sexual obscenity charges had been issued against him for his involvement in Last Tango in Paris. So at great cost, production was moved to England, only for the producers to learn that their director, Hamilton, was a tax exile and couldn’t enter the country. Faced with the prospect of losing more money relocating a second time, the Salkinds released Hamilton and hired Richard Donner to direct the movies instead. Donner’s hiring was a blessing. He recognised the screenplay for what it was – a huge problem – and decided to scrap it entirely. He hired yet another writer, Tom Mankiewicz, to redraft the screenplay, his two goals to reduce it to a manageable length and to eliminate the campness of the previous iteration. With a new script, a new director, Gene Hackman on board as Lex Luthor, and Brando convinced that being a suitcase or a bagel was not the best option for Jor-El, there was only major task outstanding: the casting of Superman himself. Like dating, all of the actors that the producers wanted for the role weren’t interested, and those that did want the part didn’t interest the producers. The list of actors that Salkind approached was long, and included Burt Reynolds, Robert Redford, James Caan, Nick Nolte, James Brolin, Christopher Walken, Warren Beatty, and John Voight. They all turned the role down (“There’s no way I’m getting into that silly suit,” Caan supposedly told Salkind). Paul Newman’s rejection cut even deeper – he not only rejected the offer to play Superman, but earlier had turned down Lex Luthor and Jor-El as well (even though he was offered $4 million for each role). Meanwhile other actors that hadn’t been approached were lobbying hard to be considered. Arnold Schwarzenegger certainly had an otherworldly physique, but didn’t have the acting chops. Neil Diamond didn’t have the acting chops or an otherworldly physique (nor, it would seem, a realistic understanding of his place in the entertainment industry). One actor who had a claim to both and was desperate for the part was Sylvester Stallone. Superman was Stallone’s childhood hero, and he did everything he could to land the gig. Just as his case was gaining momentum, however, Stallone faced a roadblock he did not see coming. As part of his seemingly endless contractual rights, Brando had casting approval. When he heard that Stallone was in the running, he vetoed the actor from being considered, just as he allegedly vetoed Burt Reynolds from playing Sonny in The Godfather. Stallone was furious, particularly after hearing Brando commenting that he saw the role of Jor-El as nothing more than a paycheck, whereas he would treat the role of Superman as sacred. Eventually Donner and Salkind decided on getting a complete unknown for the role of Superman. The casting director, Lynn Stalmaster, suggested a young actor named Christopher Reeve. Donner didn’t like the suggestion, as Reeve was too young and thin for the role. The search continued ever more desperately, with over 200 hopefuls auditioning. Things got so desperate, in fact, that Salkind’s wife’s dentist screen tested. It was as painful as you might imagine. Having exhausted all other options, Donner succumbed and allowed Reeve to screen test. Reeve blew him away. Still, the actor was too thin to play a superhero, and Donner asked him to wear a muscle suit. Reeve refused, and instead began an intense training regime under the supervision of David Prowse, the actor who played Darth Vader in Star Wars. As a result, Reeve’s weight increased from 77kgs to 96kgs. Finally, Superman: The Movie was ready to take flight. Filming began in March 1977. As two movies were being filmed at the same time, it was expected to take seven to eight months. Instead the filming dragged on for 19 long months, during which tensions between Donner and the Salkinds grew exponentially. The Salkinds were concerned that the filming was taking too long, and that the budget was forever expanding. Donner retorted that he was never given a budget or a schedule, and wanted to be left alone to do his job. Ilya Salkind admitted that Lester was there not only as mediator, but as a safety net to take over directing duties should the need arise to replace Donner. This was a foreshadowing of what was to come. As the schedule stretched out, the Salkinds ordered Donner to focus on finalising the first film and forget about the sequel, even though Donner had filmed roughly three quarters of the footage he needed for Superman II. Eventually the film was completed and it was released in December 1978. It was a huge success, grossing over $300 million worldwide, being nominated for three Academy Awards, and receiving positive reviews, particularly for Reeve’s performance and the ground breaking special effects. It was therefore a no brainer to decide to finish the sequel. Like everything that came before it, Superman II was mired in problems. As a surprise to no one, the Salkinds did not bring Donner back to finish filming the second instalment, instead promoting Lester to the directing role. The first problem with that decision was that in order to be credited as the director of a film, a director must shoot at least 51% of the footage featured in the cinematic release of the movie. Donner had already shot three quarters of the footage needed, meaning that in order to obtain the directing credit, Lester had to reshoot many sequences already captured by Donner. Also, Gene Hackman was disappointed in Donner’s firing, and in protest refused to be involved in any reshooting. Therefore all footage of Hackman in Superman II was footage filmed by Donner during the original production. Other scenes involving Lex Luthor had to be filmed using a body double. 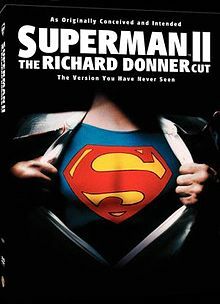 In 2006 Superman II: The Richard Donner Cut was released on DVD and Blu-Ray containing all the footage Donner had shot, including the scenes involving Brando. Other problems with the use of two directors can be seen in the final cut of the film. Both Reeve and Margot Kidder look noticeably different, depending on whether Donner or Lester directed the footage. Reeve continued to gain muscle for his role and so looks bulkier in the scenes filmed by Lester. Kidder, on the other hand, grew gaunter between 1977 and 1979, and this is reflected on screen as well. Also Lester’s scenes tended towards slapstick, a markedly different tone from Donner’s. Despite all the problems, Superman II was as big a success as the original, and few people noticed the differences. With several hundred million dollars in their coffers as a result of the films, it came as no surprise that the Salkinds continued the franchise. Sadly, the product deteriorated quickly from there.